In a small bowl, combine the soy sauce, sugar and water. If you don’t have a steamer, scrunch up three large sheets of tin foil to form three tight balls of equal size. Place in the bottom of a large pot or wok. Set a small heatproof plate on top. Carefully pour about 2cm of boiling water into the bottom of the pot. Place the fish fillets on the plate and place the pot over a high heat. Cover with a lid and allow the fish to steam for 6-8 minutes or until the fish is opaque and flakes easily. Turn off the heat. Carefully transfer the fish to serving plates. 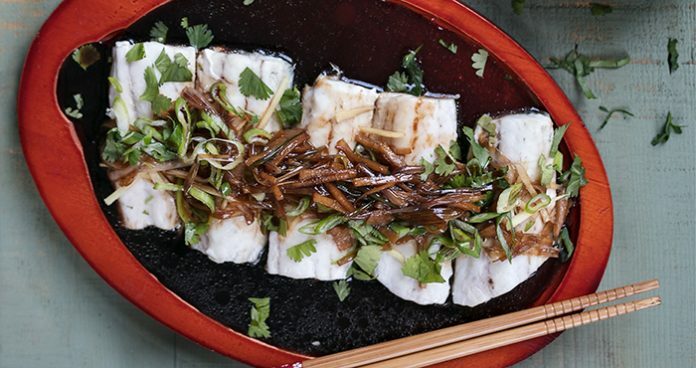 Spread the cilantro and about one third of the scallion (use the green portions), directly onto the steamed fish.